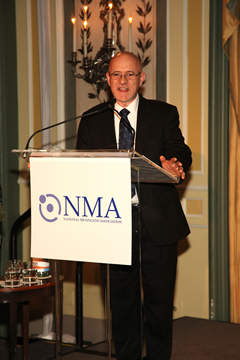 NEW YORK CITY, N.Y., April 28, 2015 – Kevin Carroll, MS, CP, FAAOP, Hanger Clinic Vice President of Prosthetics, was recently honored with the National Meningitis Association (NMA)’s esteemed Nancy Ford Springer Inspiration Award. The award, received Monday, April 27th at the 2015 NMA “Give Kids a Shot!” Gala in New York City, is for Carroll’s long-term work treating meningitis survivors, many of whom lose limbs as a result of the potentially fatal disease. Carroll, a world-renowned prosthetic expert, has spent more than 30 years developing artificial limbs, educating the prosthetics community, and working to improve the lives of amputees with a variety of limb losses. He is well-versed in prosthetic treatment needs post-meningococcal disease, and has personally worked to equip both pediatric and adult survivors with tools to improve their mobility. “Nick lost his legs and hands to meningitis and when he was comatose in the hospital recovering, Kevin was there measuring him to fit prosthetics. When he awoke he realized his limbs were gone, but I assured him that Kevin and his team were going to provide him with prosthetics to walk again. That was the one thing that reassured him during this difficult time,” said Gary Springer, husband of the late Nancy Springer, and NMA Gala Chair. Carroll is also well-known for co-creating the world’s first prosthetic tail fluke for an amputee dolphin. In the process of fitting Winter the dolphin, he helped developed WintersGel, a protective prosthetic liner that is particularly beneficial for amputees with delicate skin. More information on Carroll’s work with the dolphin is available here: http://www.hangerclinic.com/success-stories/winter-the-dolphin/Pages/default.aspx. About Hanger Clinic: Founded in 1861 by the first amputee of the Civil War, Hanger Clinic, a business unit of Austin, Texas-based Hanger, Inc., owns and operates 770+ patient care clinics nationwide. The certified clinicians of Hanger provide patients with the latest in orthotic and prosthetic solutions, including microprocessor devices for those with limb loss and neuromuscular technologies for those with paralysis due to stroke, MS and other debilitating conditions. For more information on Hanger, visit www.Hanger.com, and for more information on Hanger Clinic, visit www.HangerClinic.com. About National Meningitis Association (NMA): NMA works to protect families from the potentially devastating effects of meningococcal disease by educating the public, medical professionals and others about the disease and its prevention. The NMA network also provides critical emotional support for families who have been affected by meningococcal disease. Visit NMA at www.nmaus.org, watch NMA’s PSA “The Right Thing to Do,” and find them on Facebook or Twitter.